I love this salad. It’s so easy and versatile. Serve it with grilled chicken or salmon or just by itself! Place beetroot in a large saucepan full of water. Bring to the boil and then reduce to a simmer. Cook until beetroot is tender. 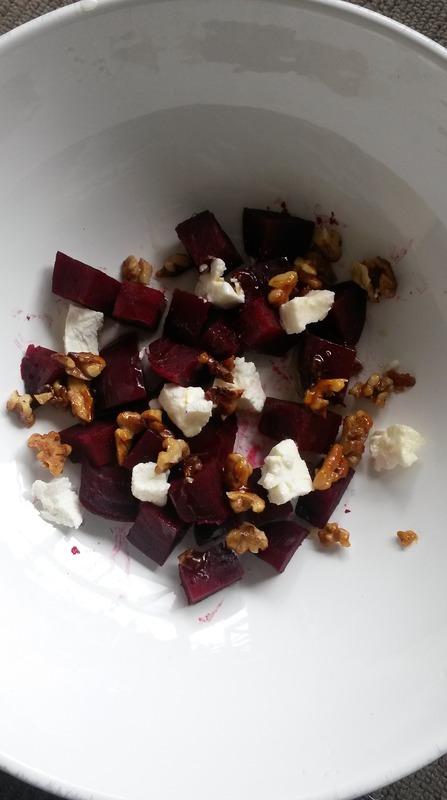 The length of time will vary depending on the size of your beetroot and can range from 20-30 minutes. Take the beetroot out and set aside to cool. While the beetroot is cooling, heat the olive oil in a fry pan over medium-high heat. Add the walnuts and heat through. Be careful not to burn them. Drizzle the honey over the walnuts and stir to coat. Add the vinegar and salt. Stir to coat evenly and then remove from the heat. Peel the beetroot and cut into 1cm cubes. Put into a serving bowl. Crumble the goat’s cheese over the top and add the walnuts. Drizzle some olive oil over the top to finish it off and serve.